It’s a fine Florida February morning, about 74 degrees and sunny. Sounds like reviewing weather to me! Today, I’m going with the Thunder by Nimish, from Nimish Desai, via cousin Rocky Patel. 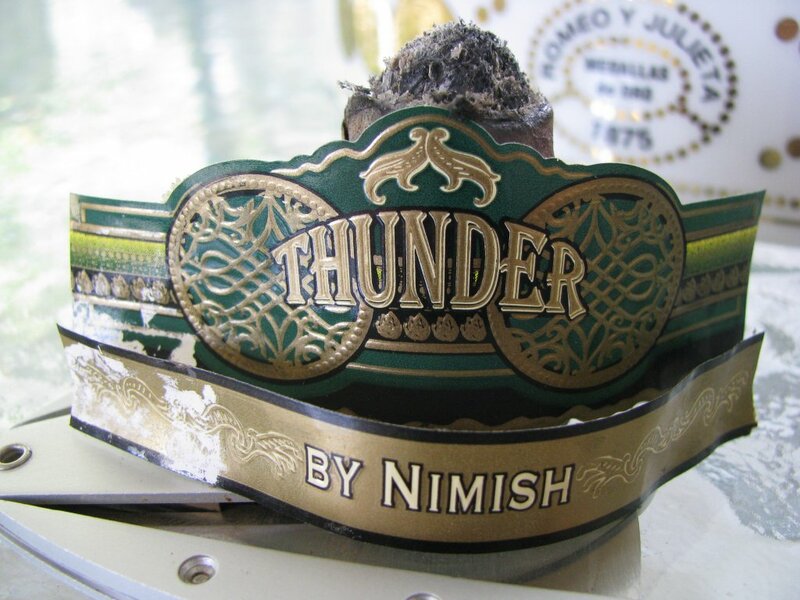 The Thunder is Nimish’s brainchild, and was brought to market a few months ago in three sizes (Robusto, Toro, and Torpedo). I picked up a few of the Robustos last week from a local B&M, two of which form the basis for this review. 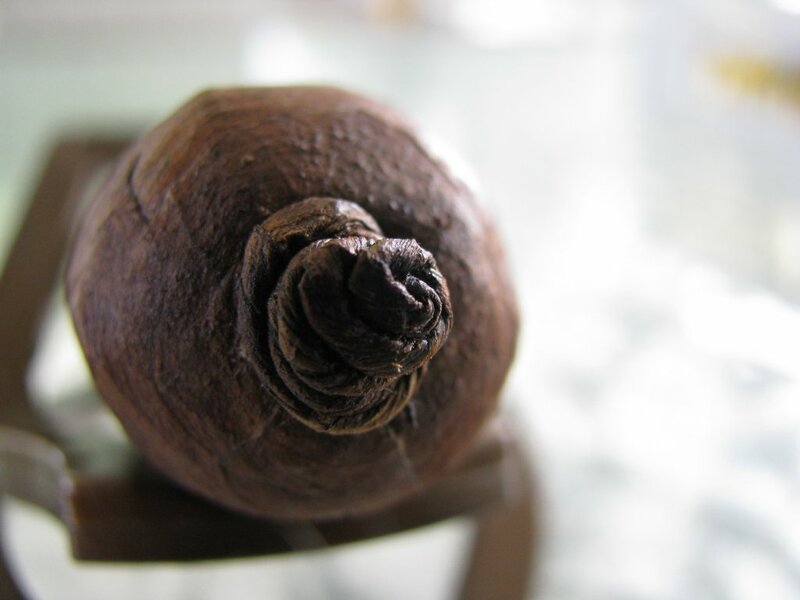 Personally, I might have called it a Short Robusto, as it’s only 4.5″ long, although it is of slightly larger girth than typical for the vitola, at a 54 ring. It has an Ecuadoran Habano wrapper, dual binders from Nicaragua and Honduras, and a Nicaragua/Honduras/Costa Rican filler mix. As I’ve mentioned before, there was a time when I enjoyed several of RP’s early blends, although I have to admit I have drifted away from most in recent years. You can find the Thunder in the Tampa market for about $5 per stick as singles, and as low as $4.50/stick if you buy in box quantities. The prelight aroma on these is ever-so-slightly sharp, but reminiscent of hay, and the prelight draw is dramatically sweet. Construction is near-perfect, and exhibits no voids nor tight spots throughout its length. The draw is open and free, with just enough resistance to put it dead center of my personal preference. The flavor on the cold draw is almost unidentifiable – I am having a hard time associating it with a specific taste, although it reminds me of cherries; not the cloying, Maraschinos you get in a jar of syrup…the actual fruit from the tree. It’s very sweet, and I can’t say I have ever experienced this so strongly in a cigar before. It is actually quite pleasant. I will attribute this to the Costa Rican tobacco, as the only thing remotely similar I recall were some sticks rolled by a local roller who used some Costa Rican leaf as well – but I have nothing to back that up outside of my own speculation. In any event, it is enjoyable. 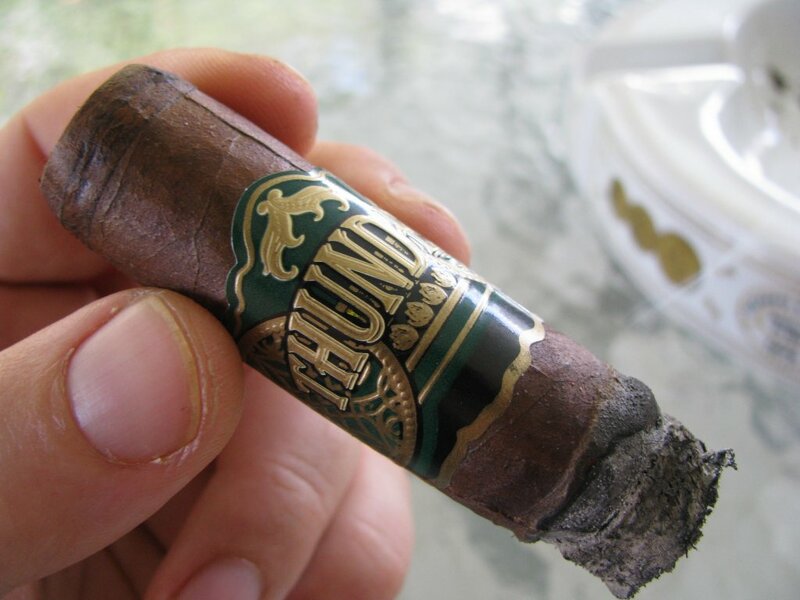 The Thunder has a small pigtail tied into the cap, which doesn’t change the smoking characteristics but is a differentiator that makes it a more attractive cigar. Upon first light, the Thunder produces tons of spice on the palate. This spice is more felt than tasted, and the flavor is akin to a oats, or some other grain. It gives a noticeable tingle to the nose upon retrohale as well. The sweetness experienced prelight is very faint, but discernible at times in the first inch. By the end of this first inch, the spice has begun to dissipate. It never completely vanishes, but does acquiesce fairly early on. The cigar produces a great deal of smoke, and burns quite well. Toward the end of this portion, I pick up a bittersweet chocolate flavor, and the “cherrylike” sweetness has disappeared entirely. It has been replaced with a differing sweetness, more like leather than fruit and more recognizably like the sweetness typically found in comparable cigars. The ash falls into the ashtray near the beginning of the second inch, and the spice has dialed back even more. A leathery flavor has stepped front and center. There is still a bit of a tingle through the nose, but it is slight. Early in this part of the smoke, I would have claimed that the Thunder was not as strong a cigar as I had expected; however, by the end of the second inch the potency has picked up in good measure, and I would rate it on the heavier end of medium or lighter side of full strength. The flavors have become more subdued at this point, but the leather, chocolate, and spicy feel remain. I also noticed the ash became remarkably more flaky in the latter part of the cigar compared to the earlier portions. I am impressed by the lifespan of the Thunder. Despite the fact that it is only 4.5 inches long, it burns at a slow enough rate that it lasted well past an hour and very near 90 minutes for me. That’s considerably longer than I expected before lighting the first one. 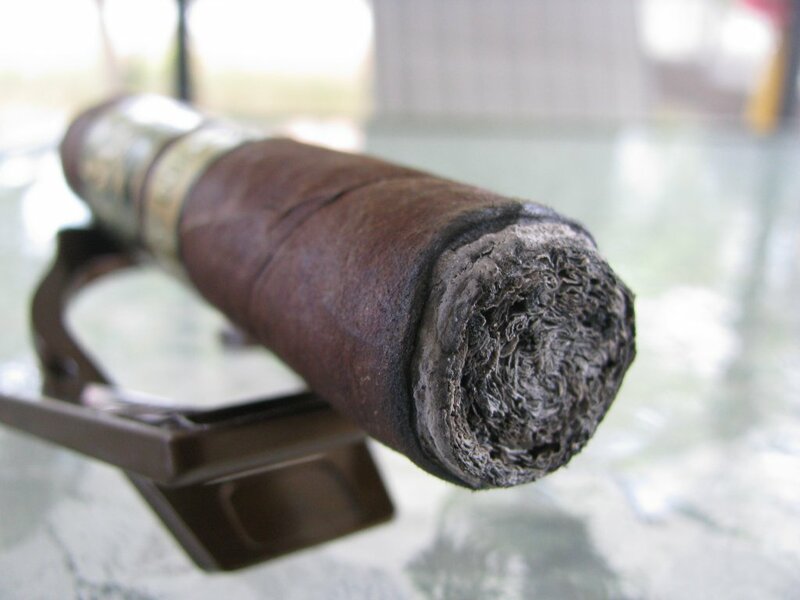 Toward the end of the stick, the flavors did develop into a profile that was somewhat ashy and tart to me, which signals the end of its life – a sure signal from many cigars. Overall, I am left with a similar impression as with the Humo Jaguar I wrote about last week. I am currently in a groove where I don’t go out of my way to seek cigars with Honduran tobacco…but this is still a very good cigar. I do have to say, the Thunder was a bit more interesting to me than the Humo Jaguar, though. And at the price, it’s a dang good value. I’m not going to knock myself out to run down and buy a box of these tomorrow, but it’s not out of the question should the opportunity arise in the future. 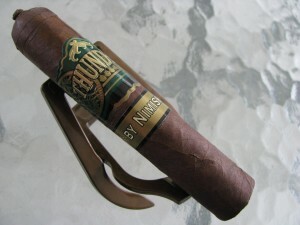 And, I certainly won’t hesitate to keep a few around in the humidor to mix things up on occasion. As a sidenote, you may have noticed a new logo in the header for The Cigarmy tonight. This is thanks to Amy over at BrandLand. She did a wonderful job of capturing what I was looking for in the logo, and I highly recommend her. You’ll be seeing several more changes in the coming days and weeks to the layout and format of the site (starting with the background image behind that logo…it seems to clash a little with the logo right now). If you have any suggestions for how I might improve the site, either in content, appearance, or navigation – let me know. I’m still very new to this and certainly open to suggestions! Thanks for the review, has been awhile since I have smoked any RPs. Can’t say that this one will bring me back in but with that price point I may give it a try. By the way I like the new logo.